Based on the popularity of the children’s book The Little Prince by Antoine de Saint-Exupery (1943) I am surprised I had never heard of it until recently. And when I say popularity I mean The Little Prince has been translated into hundreds of languages, adapted into plays, movies, and television shows. Let’s not forget the merchandise, the statues, and the almost cult-like love affair with The Little Prince that inspires fans to tattoo the little guy onto their skin. Yes, as in FOREVER. What on earth was this secret-to-me adoration all about? I had to know. So, always on the lookout for inspiring and empowering great reads for children I sent myself down to the local library happy to find a copy of the original translation from French to English. Apparently, despite a few errors by translator Katherine Woods, and despite a number of “improved” English translations since, this is still the best, most eloquent version, according to general consensus. 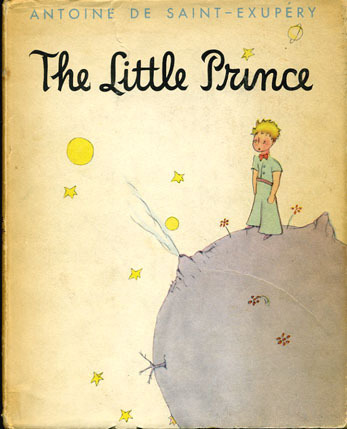 Having finally read The Little Prince, plus a few scholarly articles analyzing the many layers of this novella (just shy of 100 pages), I realize now that any casual review from me will not even BEGIN to do the book justice. As long as you’re okay with that, please continue. First of all, The Little Prince is in a class by itself. It exists somewhere between charming children’s story and deep philosophical life lesson(s) for adults. Is this book really for children? Well, not for the younger age range that I usually focus my Inspiring Book Finds on. Yet here it is. Is it intended for adults, then? Not exactly. The author himself called it a children’s book. Essentially, as intimated in the author’s dedication, The Little Prince is a book meant for all the children we grown-ups used to be. Is it safe to say that those children no longer exist? If so we might conclude that The Little Prince was written for no one and everyone all at the same time. Incredible. It manages to be a profound little book before you even turn to page 1! Now that we know who it’s for (sort of), what is The Little Prince about? The meaning of love, of friendship, loss and sorrow, disappointment, of meeting someone by chance who ends up changing your perspective of life forever. It’s about the magic of childhood, of hope, self-discovery, enlightenment. It’s about how we adults can learn to see as clearly as children do. Believe it or not, that’s just a small glimpse of the depth of this heartwarming story. With such a range of important topics you might imagine it to be a difficult read. Not so. The simple language and the inclusion of charming watercolors by de Saint-Exupery himself make the story accessible to all ages. And if you, like so many of us, are one of those grown-ups who let their childlike wonderment fade in exchange for more practical matters, you’re in for a special treat. The Little Prince is such a beautiful parable; you’re not likely to catch all of its treasures with the very first read. More likely, I imagine, you’ll find yourself HOPING your child requests it again and again and again.